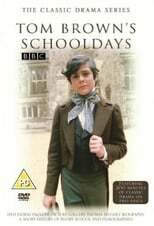 Tom Brown's Schooldays is a 1971 television serial adaptation of the Thomas Hughes novel of the same name. It was originally shown on the BBC1 Sunday tea time slot, which often showed adaptations of classic novels aimed at a family audience. It may have been more freely adapted than most of these Sunday adaptations, e.g. including Flashman's father who was not in the novel, and like some other adaptations of Hughes' novel it expanded Flashman and Dr. Arnold's roles. However it was regarded as well-acted, particularly by Murphy, Morant and Cuthbertson, and was later shown on Masterpiece Theater in the USA. Both the programme and Murphy's performance won Emmy Awards. It did include a couple of corporal punishment scenes which were rather strong stuff for family viewing.